Hurry! Offers ends 1st July 2016! 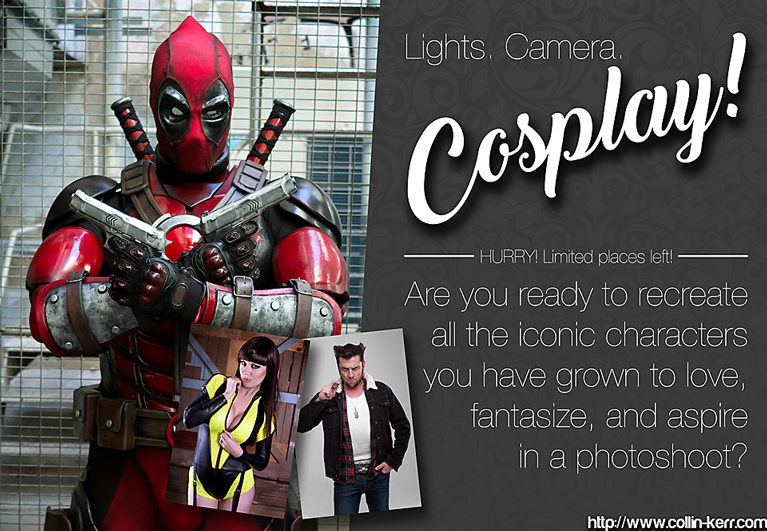 Are you ready to recreate all the iconic characters you have grown to love, fantasize, and aspire in a photoshoot? Collin Kerr Photography is hosting In-Studio cosplay photography sessions in June 2016! Time slots are very limited, so book early to guarantee your shoot! During your photo shoot Collin can provide you with basic model coaching – teaching you how to stand and pose correctly to bring great possibilities for your brightest ideas. – Have your session taken in a professional Photo Studio in Perth’s CBD, or in Bayswater. – Professional Hair and Makeup can be included at an extra cost. – Your seven best high resolution photos retouched to magazine quality sent to you via online storage or USB. What’s involved in an awesome cosplay-style photo shoot with Collin Kerr Photography? Watch this short video with Dadpool Cosplay to find out! Think about the primary reason you are in the photo session, as it establishes the mood and creative direction of your shoot. This will help you achieve the look you are after in your photoshoot. All photos will be digital and sent through online storage or on a usb. Services for printing are also available at an extra cost. A $50 non-refundable deposit is required via Paypal or Bank Transfer to confirm all bookings. This will be deducted from your final invoice.